I recently moved to Washington, D.C., where I work as a research assistant in the health program at the American Institutes for Research, a not-for-profit social science research organization that partners with a variety of health-related government agencies. I also help plan events for the Alumni Club of Washington and enjoy running into fellow Brandeisians in the D.C. area. BOLD GENEROSITY. 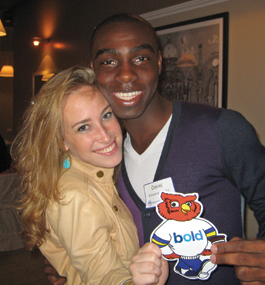 Julie Judson ’11 and Daniel Acheampong ’11 pose with Flat Ollie at the recent Bold donor appreciation brunch in Boston. The event recognized Bold Justice Brandeis Society members, consistent donors and members of the Class of 2012 who contributed to the senior class gift. Brian Reeves, who is pursuing a graduate degree at the Hebrew University of Jerusalem, is writing a blog for Americans for Peace Now about his experiences in Israel.He worked as a summer intern at the organization last year. At Brandeis, he was the president of J Street U. Brett Segall is CEO of eMuze, and classmate Maxwell Zotz serves as senior vice president of development at the Boston startup. In April, the company co-sponsored On the Verge: Boston to provide an outlet for student fashion designers and people interested in the fashion industry. EMuze is developing a platform that will connect aspiring entertainment and media talent with industry professionals and fans. Jamie Fleishman will travel to Hong Kong this summer to help manage Yale-China’s Service Internship Program. While in China, he hopes to connect with Brandeis alumni in both Hong Kong and mainlandChina. Jermyn Addy writes, “I’d like to congratulate the Class of 2012 and welcome them to the alumni family. I also want to wish all graduates of the Class of 2011 a peaceful, prosperous and productive year.” Aaron Louison works in the Office of Development and Alumni Relations at Brandeis, where he focuses on giving and the Bold (Brandeisians of the Last Decade) program. He is also pursuing a Ph.D. in nonprofit management at the Heller School for Social Policy and Management. Dana Schneider moved to Los Angeles after graduation with two fellow alumni. She now works at Warner/Chappell Music, the global music publishing company of Warner Music Group. She coordinates music for film, television and other media, and books festival appearances. Leigh Nusbaum works at American Continental Group, a Washington, D.C.-based consulting firm. She is thrilled that so many of her ’Deis friends are in D.C. as well. After working last summer in the woods of Tennessee and spending the fall teaching environmental education in South Carolina, Rebecca Ludwig has accepted a research job in Philadelphia. Andrew Gluck moved to the Upper West Side. He has worked in the online marketing field since graduation and is currently a senior marketing associate at Quidsi, one of America’s fastest-growing e-commerce companies, where he focuses on the wag.com site. Akiva Newborn writes, “Hey, Class of 2011! This year, I am getting an M.A. in biblical studies at Yeshiva University, and next year I will be in law school.” Andy Hogan is serving as a summer intern for a judge in San Diego, his hometown. He will be a second-year law student at Georgetown in the fall. Elysha Greenberg lives in Brookline, Mass., and is pursuing a master’s degree in mental health counseling at Boston College’s Lynch School of Education. She also works as a nanny for an adorable 1-year-old girl, and still enjoys dancing with the Brandeis ballroom dance team and connecting with friends at Brandeis. Keriann Shalvoy works in the Longwood Medical Area and is moving to Brookline, Mass. She misses shows at Chum’s and late-night library conversations! Jenna Rubin is enjoying one of the best perks of being a teacher — summer vacation. She completed her first year as a third-grade teacher with Teach for America in Atlanta. Caryn Nearnberg is studying optometry at the New England College of Optometry in Boston. Yoanna Freedman works at Liberty Mutual. In her spare time, she enjoys attending events for Boston Yachad, an organization dedicated to addressing the needs of individuals with disabilities. Matthew Kriegsman founded a mentor’s program at Cardozo School of Law that is modeled after his experience as a Roosevelt Fellow at Brandeis. The Benjamin N. Cardozo School of Law Mentors Program helps first-year law students with both their academic and social transitions. Matthew led training sessions, collaborated with Cardozo administrators and created the group’s structure. Max Shay lives in Oak Bluffs, Mass., and co-founded his own design company, Idiomation. He has spent the past year working with multiple tech startups and has helped found a couple of his own. Roxanne Bischoff lives in San Francisco, where she works with the University of California-San Francisco/University of California-Hastings Consortium on Law, Science and Health Policy. She sometimes misses the East Coast, but is enjoying her new life in the Bay Area and loves the California weather.